Fields makes room for thorough character development in this thriller otherwise driven by action, suspense, and themes of human nature. 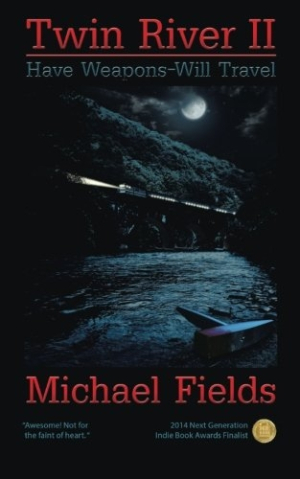 In the second installment of Michael Fields’s acclaimed Twin River saga, Twin River II: Have Weapons Will Travel, the pressure is on Wesley Palladin, second-generation hit man for the mob and reluctant accomplice to Matt Henry, a troubled teen from a troubled town. As he twists psychological thrills together with grisly action sequences, Fields delivers a fast-paced, thought-provoking look at the chilling violence of nature and man. When a contracted hit spirals out of his control, Wesley Palladin decides to lay low for a while in the backcountry of Pennsylvania. Hired by high school sophomore Matt Henry to fulfill the dubious role of head of bank security, Palladin soon realizes that the sinister shadows cast by the aptly named Blood Mountain hide more than a few deadly secrets. Set in 1980, when Matt is fourteen years old, the book’s opening flashback to Wesley’s own fourteenth year in 1966 details the assassin’s initiation into the life of a gunman. Wesley often echoes his father’s lessons and advice when dealing with Matt. The unlikely partnership of these two fierce yet principled characters provides a sense of coming full circle as they wade through the interference of corrupt lawmen, sadistic bullies, kidnappers, and unhappy mobsters, making room for character development and revelations in an otherwise action-driven narrative. References to classic cars, movies, sports, athletes, and songs lend authenticity to the time and place, interrupted only by a few minor inconsistencies, such as Wesley being fourteen years old in 1966, then introduced as a thirty-six-year-old in 1980. Twin River II works well as an independent story, although the addition of characters from Twin River in minor roles and the abrupt cliffhanger ending leading to Twin River III: A Death at One Thousand Steps place it directly in the middle of Fields’s ongoing saga. Twin River II: Have Weapons Will Travel is ideal for those who prefer a dose of reflection and depth of character along with swiftly moving action and lurid confrontations.